If you are comfortable installing with the composer, download the app from Github directly https://github.com/speed-up-website/freessl.tech-auto. If you don't have experience with the composer or don't know what the composer is, please click here to download the app (2.71 MB). This zip archive comes with all the dependencies pre-installed. Now upload the zip archive to the document root of any of your websites or sub-domain (e.g., www.YourDomain.com or http://sub.YourDomain.com) or any other publicly available directory of your web hosting server. 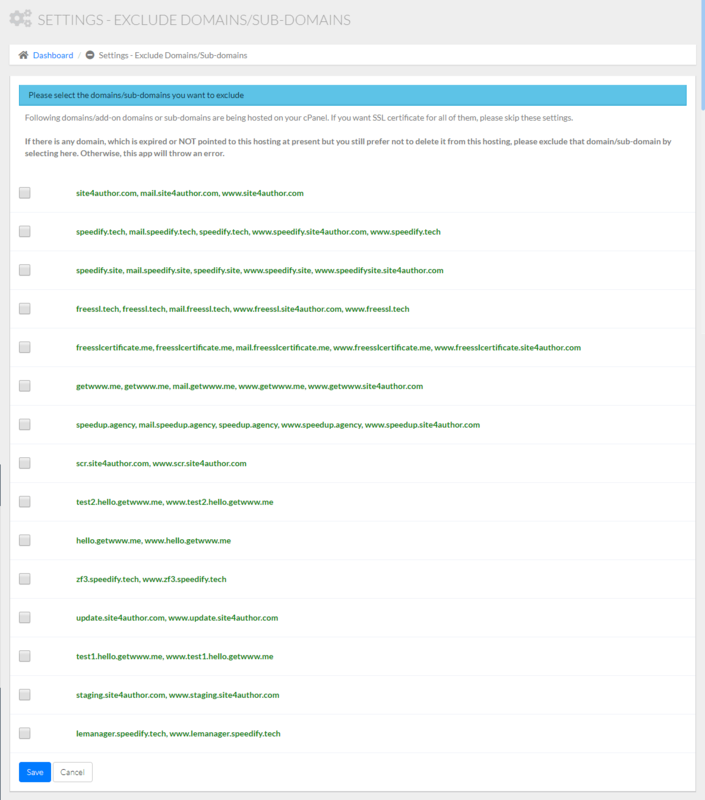 Extract the uploaded archive. You'll get a directory named FreeSSLDotTechAuto-master. Don't forget to rename this directory, e.g., mycert. 2. In the pop-up window Select the WebRoot / Document Root of your website, select 'Show Hidden Files' (dotfiles) and click Go. 4. Click Select File button in the new window. 5. Browse to the zip archive you downloaded in step A and click Open. When the upload completes click Go Back to "home/username/public_html/..." link at the bottom of the page. 6. Now select the uploaded zip in the file manager and click on Extract at the right side of the top toolbar. 7. A pop-up window opens. Click Extract File(s) button. 8. 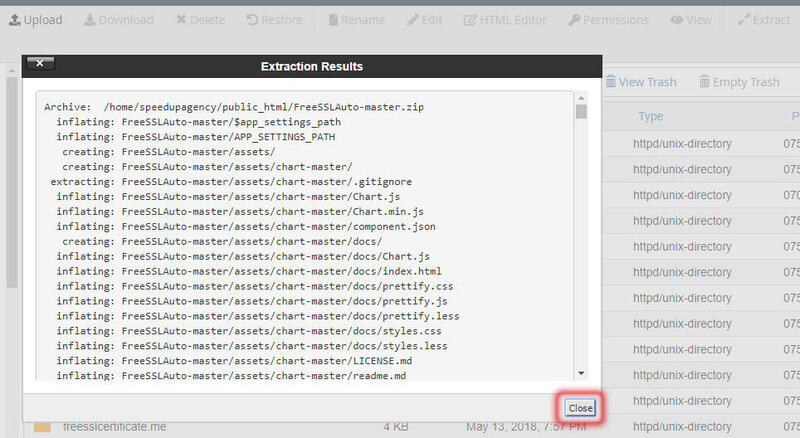 When extract completes, a confirmation window 'Extraction Results' opens. Click Close. 9. A new folder/directory has been created, named FreeSSLDotTechAuto-master. Right click on this directory and select Rename. 10. Type the new name, let's say 'mycert' and click the Rename File button. In your web hosting control panel, create a MySQL (or MariaDB) database and user, with all privileges. In this example, we are using cPanel. 1. Click MySQL Databases under the 'Databases' group of your cPanel. 2. On the next page, you'll find a form to Create New Database. Type any database name of your choice and click the 'Create Database' button. On the next page (confirmation page) click the 'Go Back' link. 3. So, you have created a MySQL database. Now you need to create a database user. Please scroll down the MySQL Databases page, and you'll find MySQL Users section. There is a form Add New User. Type username and password of your choice and click Create User button. If you use the 'Password Generator' to create your password, don't forget to copy it. On the next page (confirmation page) click on the Go Back link. 4. Now you need to add the user to the database with all privileges so that the user can access the database and perform all actions. 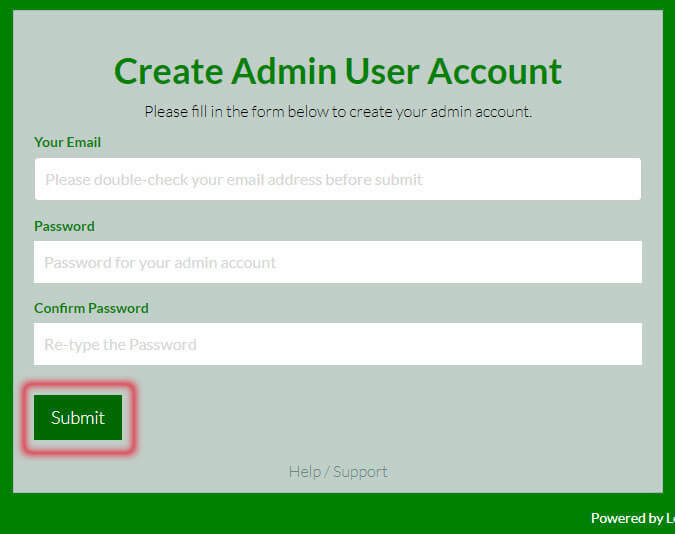 In the MySQL database page, just below the Add New User form, there is a section called Add User To Database. Select the user and database from the drop-down menu and click Add. 5. 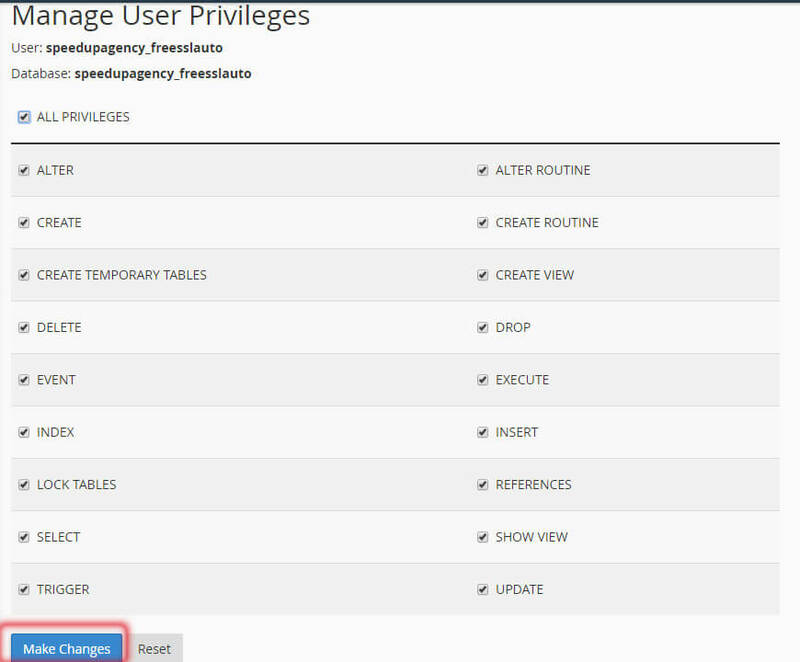 On the next page click on the ALL PRIVILEGES checkbox. This selects all other checkboxes (privileges) in that form. Now click Make Changes button. You'll get a confirmation message. The user is added to the database successfully with all privileges. Now click the Go Back link. If the current domain (YourDomain.com) has an existing SSL certificate installed, directly go to the 'Install the app with HTTPS (recommended)' section. 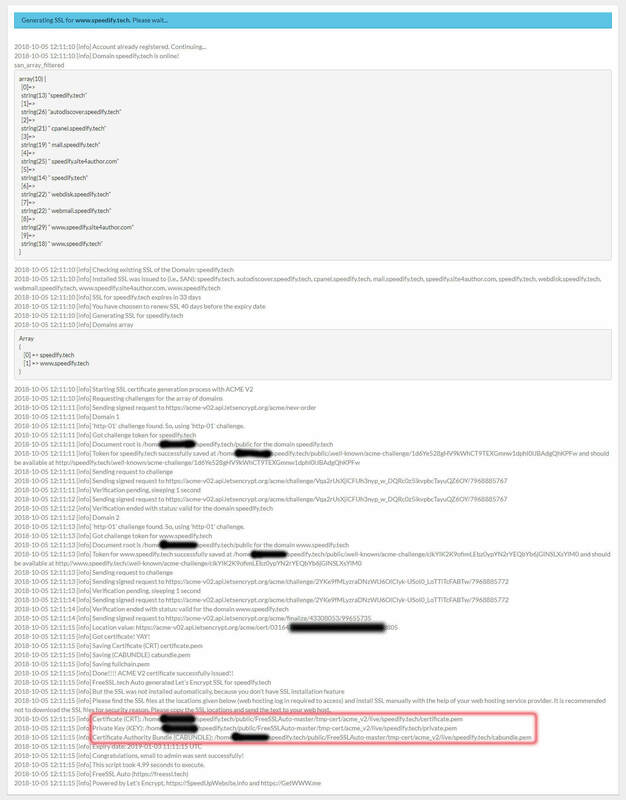 Otherwise, if you access the app over an unencrypted connection (HTTP), you get the installation page like the following screenshot. 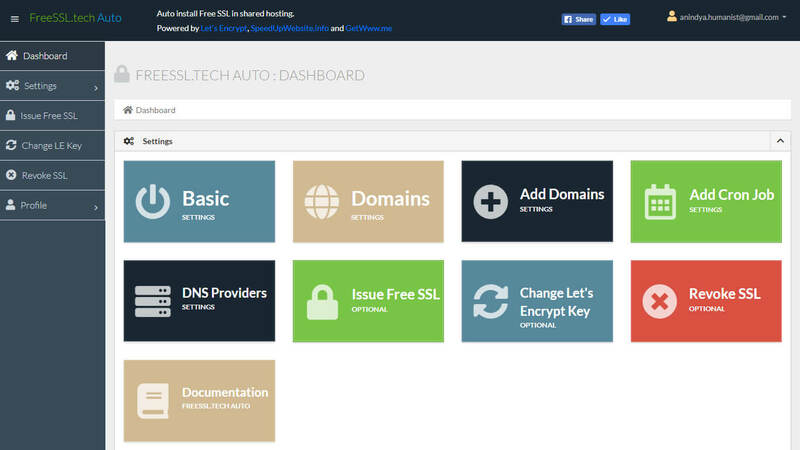 If your web hosting control panel (e.g., cPanel) has SSL installation feature enabled, you can install the SSL certificate on YourDomain.com easily. Otherwise, contact your web hosting provider to install the SSL certificate for you. For security, reason, please don't download the SSL certificate, private key and CA bundle. Instead, copy-paste the location of these files from the page or email and send that text to your web hosting provider. If you access the app with HTTPS, you get the installation page like the following screenshot. 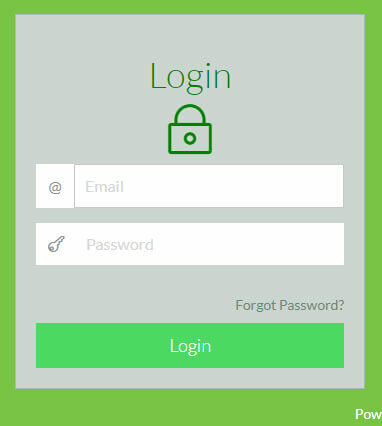 Now fill in the form with the database name, username, and password you created for this app and click on the Submit button. Now you are going to create your admin account for the app. Fill in the form with your email id and set a password. Then click on the Submit button. Congrats! 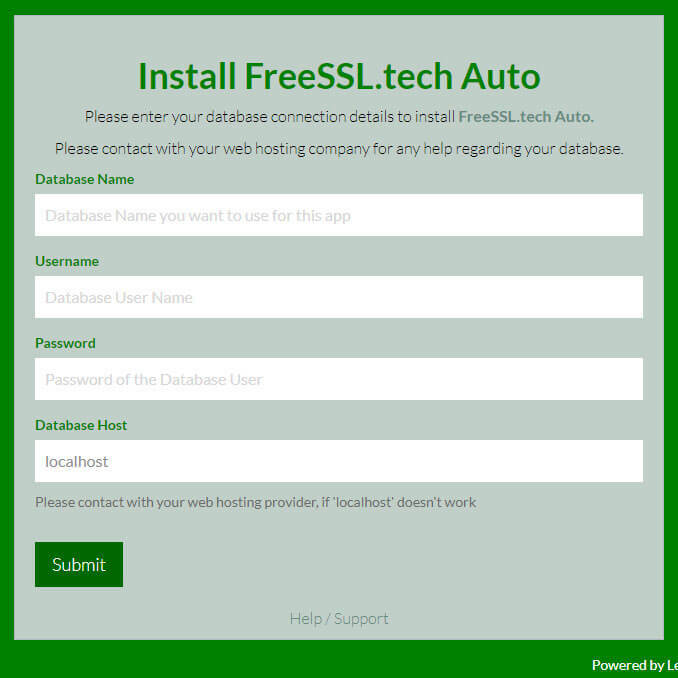 You have successfully installed the FreeSSL.tech Auto app. You get a confirmation message and a large button which links to the login page. Click on it. Initially, you get only one option (basic settings) on the dashboard. The app displays other options based on the information you provide with 'basic settings.' So click 'basic settings', and you get the form like the screenshot given below. All the fields are self-explanatory. Fill in the form with appropriate information and click the 'Save' button. The app redirects you to the next form and so on. You may anytime click the 'Dashboard' menu from the navigation of the left sidebar to access the dashboard. However, we recommend filling in the form one by one, as per the app redirects you. Four types of screenshots of the complete dashboard are given below. You get any one of them. Basic settings *:, This is the very first option you start. The app displays other options based on the information you provide here. cPanel settings *: You get this option if your web hosting control panel is cPanel. You need to provide your cPanel login details here. We use OpenSSL encryption to save your cPanel password as encrypted text and store above your public_html folder. 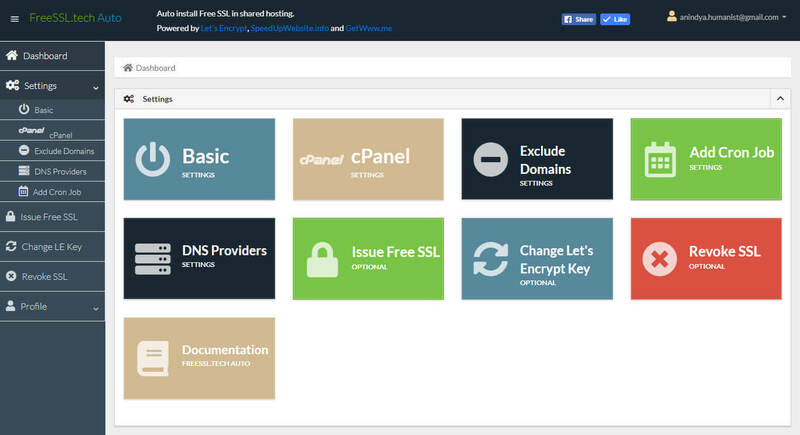 This app uses cPanel API to fetch all of your domain details and to automate the installation of free SSL certificates. That means complete automation (including SSL certificate installation) of your free SSL certificates even in shared hosting cPanel. However, if your cPanel doesn't have SSL installation feature, please contact your web hosting provider for SSL installation. You receive an automated email for every issue/renewal of SSL. The email contains the path to SSL files. 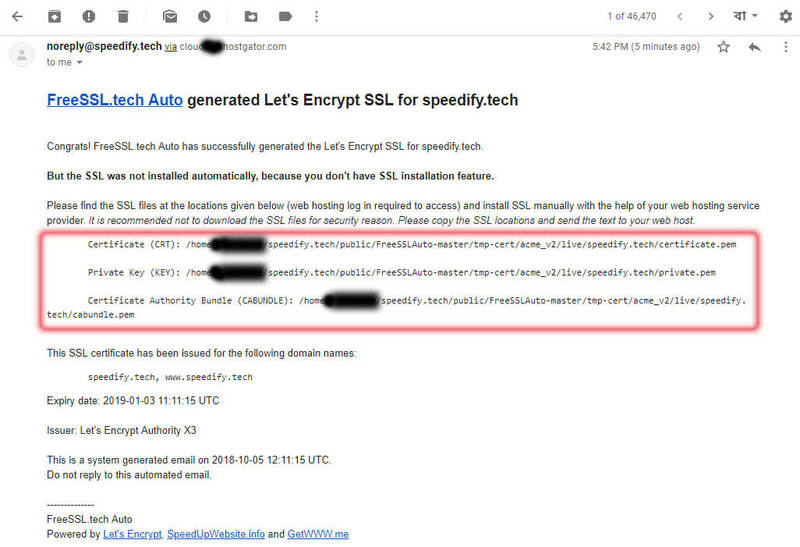 You can merely copy-paste path of SSL files and send it to your web hosting provider for installation. Exclude Domains (optional): You get this option if your web hosting control panel is cPanel. This option is optional. If you want free SSL certificates for all the domains and sub-domains in your cPanel, please skip this option. 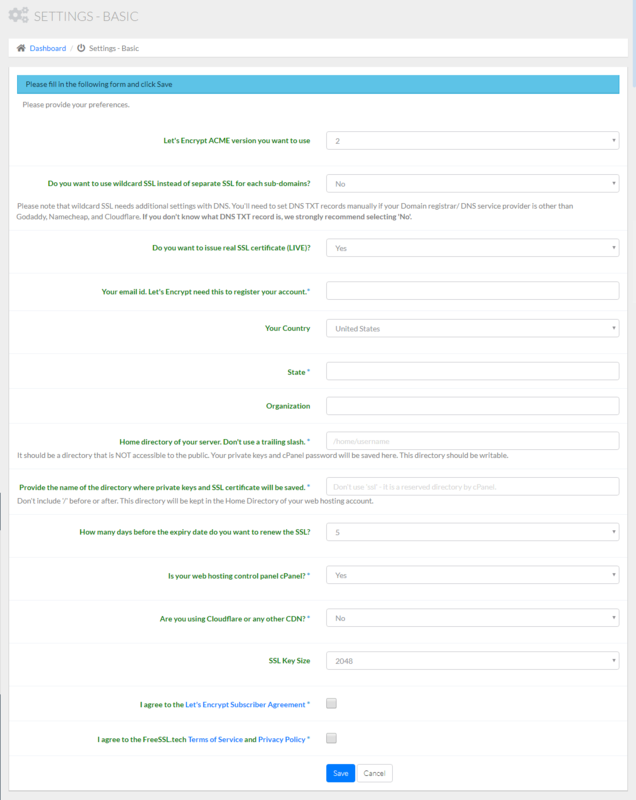 However, if there is any domain in your cPanel, which is expired or NOT pointed to this hosting at present but you still prefer not to delete it from this hosting, you should exclude that domain/sub-domain by selecting the respective checkbox and click 'Save' button. Otherwise, this app throws an error. Add Domains *: You get this option if your web hosting control panel is NOT cPanel. This app needs your domains' details, which are hosted on your web hosting server, to auto-generate free SSL certificates. You can provide your domain details with this option. Domains *: You get this option if your web hosting control panel is NOT cPanel. This option lists all the domains' data you entered with 'Add Domains' form. 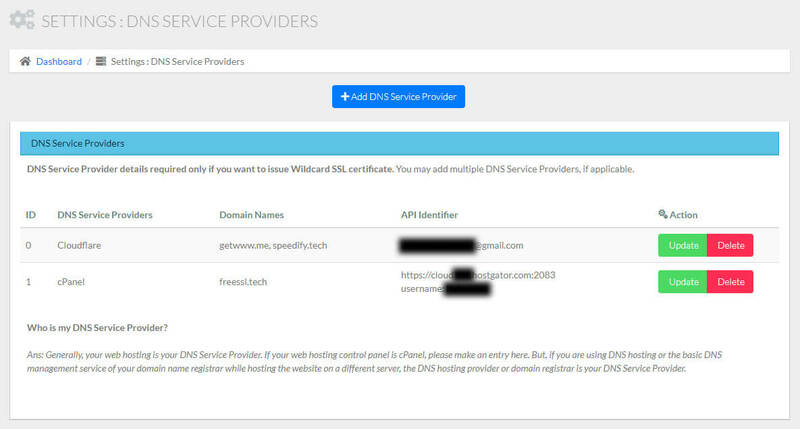 DNS Service Providers *: You get this option only if you want to issue free wildcard SSL certificates. This app needs your DNS Service Provider's details to set DNS TXT record to verify your domains automatically. Setting DNS TXT record is the only challenge type Let's Encrypt ACME V2 API uses to issue free wildcard SSL certificates. 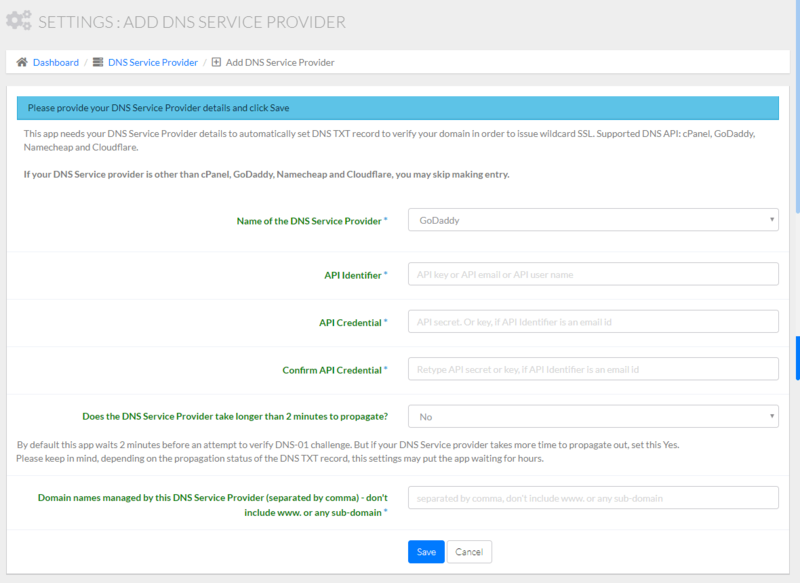 Supported DNS Service Providers are cPanel, GoDaddy, Namecheap, and Cloudflare. You may add multiple DNS providers, if applicable. If your DNS service provider is other than cPanel, GoDaddy, Namecheap, and Cloudflare, you may skip making entry. API Identifier: For Godaddy your 'API Key' is the API Identifier. For Cloudflare your login 'email' is the API Identifier. For Namecheap your 'username' is the API Identifier. API Credential: For Godaddy your 'API Secret' is the API Credential. For Cloudflare and Namecheap your 'API Key' is the API Credential. Add Cron Job *: If you have done all the required settings now, it's time to add a cron job. You can do this from this option's page with just a single click. No Linux command line expertise required. The cron job runs this app automatically once every day at 12:00 a.m. midnight (your server's time zone) to issue/renew and install the Let's Encrypt free SSL certificates. If you want the cron job to run at a different time, please skip this option and use the cron job option of your cPanel / web hosting control panel. Remember to set the cron job at least once every day. You'll get the path of the cron file in this option's page. Path of the cron file: If the absolute path of the app directory is /home/username/public_html/mycert, Path of the cron file is /home/username/public_html/mycert/cron.php. The 'Add Cron Job' page shows you the actual cron file path. 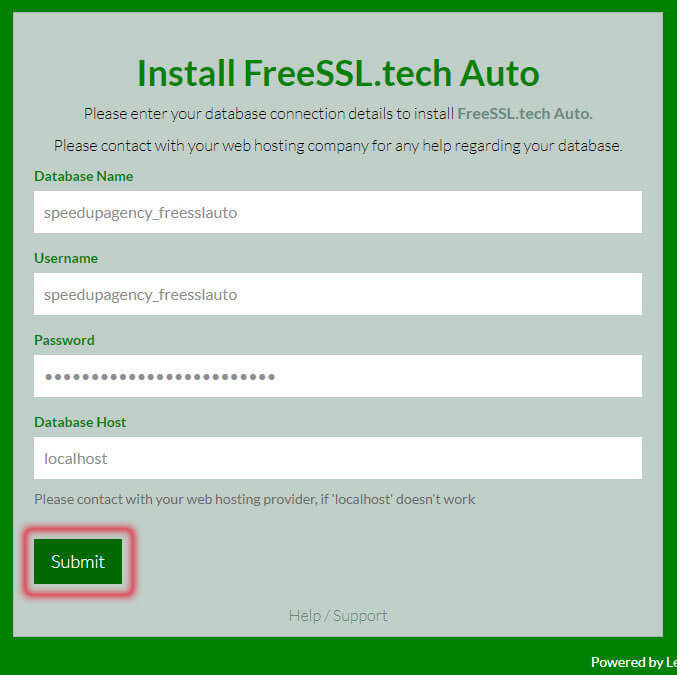 Issue Free SSL (optional): If you need free SSL certificate ungently, you may click this option. However, if you have so many domains/sub-domains (e.g., more than 5) and/or if you need wildcard SSL, please don't use this option. You may face timeout error otherwise. Please depend on the daily cron job in such cases. Change Let's Encrypt Key (optional): Click this option if you want to change your Let's Encrypt account key. Revoke SSL (optional): This option lists the domains/sub-domains for which this app issued SSL certificates. If you want to revoke any of them, you can select the respective checkbox and click 'Revoke SSL' button. Please don't forget to uninstall the SSL certificate by log in to your cPanel/ web hosting control panel.